With Mike out having fun at CampFest, it was sure to be an interesting day on the bayou. There was plenty of rain in the forecast, but with luck, it would hold off long enough for a good day’s work. The first thing that stood out on arrival at the park was that a brand new bollard had been installed at the end of the sidewalk. This would have gone completely without note, except that the new bollard just happened to match our red Old Town Guide 147 canoe. With the existing pipe fence and bollards matching the green canoes, we couldn’t help but feel as if color coordination was intentional. 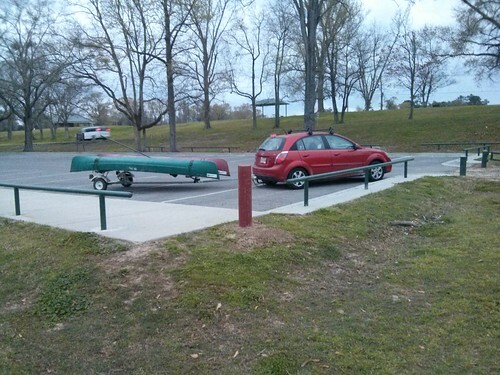 (Not pictured is the photographer, who was also wearing a matching green shirt and red shorts, making the whole car, park, canoes, and paddler setup all Christmas-y.) A quick check on the bayou continued the season of giving, with the water a pleasant 63°F and down four feet from the bottom of the bridge. The way downstream was mostly uneventful. Even zombie blockage #11 was behaving for the time being. Then, around mile 2.5, there was a crashing through the forest and palmetto. There on the bank, in a desperate charge to get back to the safety of the bayou, was a river otter! There was plenty of time for positive identification (although not nearly enough time to grab a camera), marking this as the first time we can say without reservation that yes, we have actually seen an otter on Bayou Fountain. That wasn’t the only animal making an appearance on the day. In addition to plenty of fish splashing up a storm and turtles, turtles everywhere, there was a reptile of a different persuasion. I myself was coasting under a perfectly nondescript branch that was arching over the water, when just as I was about to pass under, I noticed something that I was rather certain was not in any way made of wood. I had a quick thought that I hoped the snake was feeling rather mellow, and sure enough, it did not appear bothered in the least by a near-passing canoe. As it was perfectly content to remain there sunning itself, I took a moment to grab a camera and get a nice shot for all the snake lovers out there. 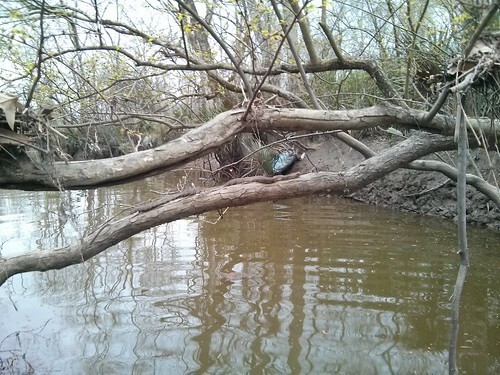 There was work to be done along the bayou, including some rather *long* logs/trunks that had made an appearance. A few of them are now in multiple pieces less prone to being caught up again. There were some accumulations of flotsam, but at no point was there enough to prevent a canoe from sliding right on by. With some special work along the way, it was about three hours before Bayou Manchac got its visit for the day. The current on Bayou Fountain was barely perceptible, but the current on Bayou Manchac was unmistakeable. It would not be too difficult to paddle against, but you could plainly see things moving along (whereas on Bayou Fountain, you almost had to stare for a while). We continue to play Chase the Flotsam as we go down the bayou, but we’re getting quite close to the end. The logs have mostly moved through, except for a handful of very long ones that will get shorter the next time we meet them. 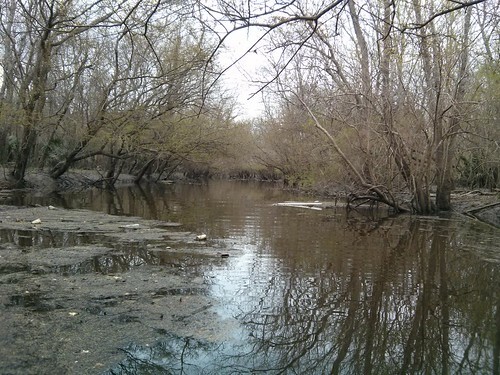 There are only a few spots where submerged logs seem to be an issue. For the most part, the flotsam is getting caught up on submerged branches. 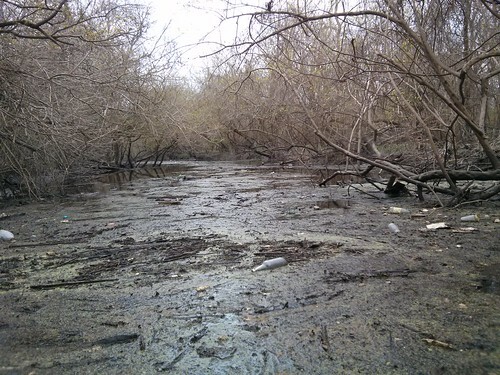 Once the snags are pulled apart, everything just heads on down the bayou. This is what it looks like as you’re pulling it apart and watching it head along downstream (if you look in the distance, you can see the flotsam making what looks a lot like a path along the bayou).